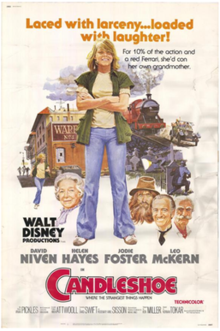 Casey (Jodie Foster) is a wayward teenager who bounces from one Los Angeles foster family to another. She is lifted from her rough life by con artist Harry Bundage (Leo McKern), who offers her a chance to get in on the criminal opportunity of a lifetime: impersonate a missing British heiress, and search the Elizabethan mansion Candleshoe for a pirate’s lost treasure. It could score Casey a fortune – so long as the mansion’s owner (Helen Hayes) and butler (David Niven) do not find out the truth. Walt Disney Pictures started producing live-action family features with Treasure Island in 1950. The range of films that followed were not often the most critically acclaimed, but did establish a remarkably strong brand for children’s entertainment through the following two decades. By the 1970s, however, Disney’s fortunes faltered: fashions changed, but Disney did not. Films that previously felt wholesome and entertaining were beginning to feel out-of-date and hopelessly twee. Once Hollywood’s blockbuster culture exploded with Jaws (1975), the live-action Disney films simply failed to find an audience any more. In the twilight between this fall and the commercial unsuccessful ‘Dark Disney’ films of the early 1980s, the company released a string of commercially underwhelming family films. Candleshoe is an excellent example, released seven months after Star Wars and showcasing a company well out of fashion and floundering in a transformed market. Some effort has been made to make the film a little more contemporary. Casey is a more 1970s-style protagonist, with a bit of an edge to her compared to traditional juvenile heroes. Jodie Foster, fresh from co-starring in Martin Scorsese’s Taxi Driver, is a more nuanced and sophisticated actor than previous leads. Sadly the English environment into which she steps is easily 15 years out of date, and reflects the much more simplistic and predictable vision of British society that Walt Disney himself had tended to favour. The use of well-known performers like Helen Hayes (in her final on-screen role) and particularly David Niven lend the film an excess of British stereotypes; they do not do the film many favours. Niven in particular is a weirdly old-fashioned delight, but he simply feels wildly out of date. The film feels weirdly underwhelming on its own merits. The pace feels slightly leaden. The characters are a little thinly drawn compared to the Disney standard. The direction lacks enthusiasm, and the screenplay does not generally anywhere close to the action and complexity to make it a properly entertaining picture. The climax in particular feels badly under-choreographed, with the actors running around Candleshoe’s great in a matter than looks weak and poorly rehearsed. Director Norman Tokar was never Disney’s strongest feature director, but he was a prolific one: his films included the likes of Big Red, The Ugly Dachshund, and The Apple Dumpling Gang. Candleshoe is probably the weakest of his work: it’s watchable, and enjoyable in fits and starts, but it is also a general disappointment. Within a few years, with the likes of The Watcher in the Woods, Something Wicked This Way Comes, The Black Hole, and Tron, Disney’s live-action productions became much more interesting.